Game More. Watch More. Share More. No more taking turns doing the things you love. The Archer C3150 V2 keeps everyone online at the same time, no matter what they’re doing. Powerful XStream processing, 4-Stream, NitroQAM and Airtime Fairness all combine to make your Wi-Fi faster than ever. MU-MIMO lets your router talk to many devices at once, and Smart Connect makes sure each one has the fastest connection possible. 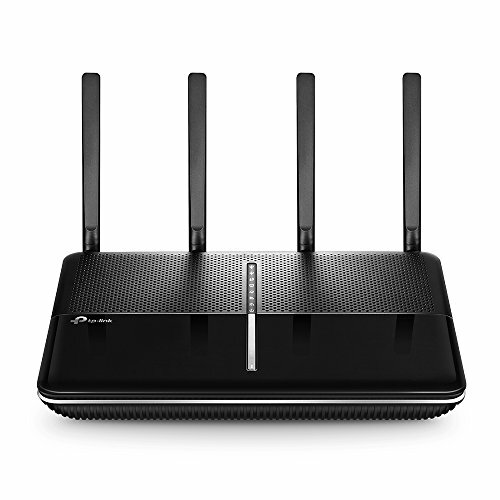 With its advanced Wi-Fi technology and innovative antenna design, the Archer C3150 V2 creates powerful Wi-Fi coverage and lets more than 25 devices stay connected at the same. With XStream processor architecture, the Archer C3150 V2 dedicates one processor to each of its Wi-Fi bands. These processors handle Wi-Fi traffic, freeing the router’s dual-core CPU to take care of everything else. All this extra brainpower keeps your Wi-Fi running smoothly so everyone in your home can enjoy what they love most, whether that’s watching Netflix, gaming online, streaming music, or all of the above. 4-Stream and NitroQAM work together to get your devices running faster. 4-Stream adds an extra data stream to each Wi-Fi band for four total streams per band, and NitroQAM helps each stream process data more quickly. Combined, these two advanced features increase speed by 25% overall, letting you watch movies in 4K and game online at the same time without slowing down your Wi-Fi. MU-MIMO lets the Archer C3150 V2 talk to several devices at once, and Smart Connect automatically places each device on the best available Wi-Fi band. With both working together, everyone can hop online at the same time without having to wait, and each device can always get the best connection. Older G and N Wi-Fi devices are slower and need more time to send data than newer, faster AC Wi-Fi devices. With Airtime Fairness, your router equally divides attention between newer and older devices improving overall Wi-Fi performance and reliability without letting older devices limit your network. QoS lets you assign more bandwidth to your favorite devices, keeping them running smoother. If you love watching Amazon Prime on your smart TV or game console, you can give more bandwidth to both so your favorite shows load quickly. Team two of the four Gigabit LAN ports for a single device for a faster wired connection with a combined speed of up to 2 Gbps. Double the connection speeds to a Network Attached Storage (NAS) for even faster streaming and data backups than ever. When using public Wi-Fi, establish an encrypted VPN connection to your router to enjoy safe and secure internet access. Browse the web in a coffee shop, download important files while waiting for your flight at the airport, and access private router-connected hard drives at home from afar without worry or paid subscriptions. The Archer C3150 V2's Web UI provides easy access to the latest available firmware so you can always keep your network up to date. The router will immediately notify you if any critical updates are available for download. Four dual band antennas send strong Wi-Fi coverage, letting you enjoy what you love anywhere in your home, from your favorite spot on the couch to the comfort of your bed. USB 3.0 and 2.0 ports make it easy to share photos, videos, and music on your home network. When away from home, a VPN allows you to securely access NAS drives and other devices connected to the router through USB. The Archer C3150 V2’s web interface has been optimized for mobile devices, making setup on your phone or tablet simple. When your network is up and running, you can download the free Tether app to easily adjust network settings or manage your home network while away. TP-Link is the world’s number one provider of consumer Wi-Fi products, shipping half a million products to over a hundred countries every day. Unlike our competition, we believe support should be free, so our team is available 24/7 to provide no-cost technical service, including setup assistance, for the lifetime of our products. And for peace of mind, we back each of our products with an industry-leading two-year warranty. * Maximum wireless transmission rates are the physical rates derived from IEEE Standard 802.11 specifications. Range and coverage specifications are based upon test results under normal usage conditions. Actual wireless transmission rate and wireless coverage are not guaranteed, and will vary as a result of 1) environmental factors, including building materials, physical objects and obstacles, 2) network conditions, including local interference, volume and density of traffic, product location, network complexity, and network overhead and 3) client limitations, including rated performance, location, connection quality, and client condition. Two or more 1×1 MU-MIMO-enabled client devices must be connected to achieve faster performance. ** To access remote network management features, customers must sign-up for a free TP-Link account *** According to latest published IDC Worldwide Quarterly WLAN Tracker Report, Q3 2016 Final Release.